The ASUS ROG Apex line of boards have always been known for its focus on overclocking as well as unique design implementations like the "X" shaped board and the unique 'DIMM.2' slot - a DRAM-like slot for a bundled add-in card that can be used for two additional M.2 modules on a PCIe 3.0 x8 link. The Z370 ROG Maximus X Apex sticks with its pedigree and even adds a 5G network port to a long feature list. Straight off the bat, it is hard to ignore that the Apex is not a rectangular motherboard. ASUS has cut the Apex into a more esoteric shape, almost like an X, to differentiate itself from other products on the market. It is a little odd, given generations of rectangles, although it is worth noting that motherboards do not have to be rectangles at all - as long as it fits in the standard, go crazy. The Apex fits the standard, requiring an E-ATX chassis, and the extra PCB area is used extensively for features. The Maximus X Apex, by both pricing and feature set, places it in the high-end enthusiast segment for the Z370 platform. The Apex includes a lot of features focused on overclocking but is well rounded enough to do anything from gaming to workstation level activities. An example of the overclocking pedigree is in the upper right-hand corner, where there are several buttons, switches, and voltage read points that are all dedicated overclocking features to make extreme competitive overclocking easier. To that end, the board uses two DRAM slots rather than the four we would normally expect to see on full-size, premium cost motherboards. ASUS mentions this was done to have better trace routing and helps with higher memory speed support, but also gives room for features such as DIMM.2, as shown below. The Apex also includes an Aquantia AQC108 5G LAN port for faster network connectivity and also has a bright RGB LED implementation. The ROG Maximus X Apex is a board aimed at users who want all of the performance out of this platform while not falling short most anywhere else. 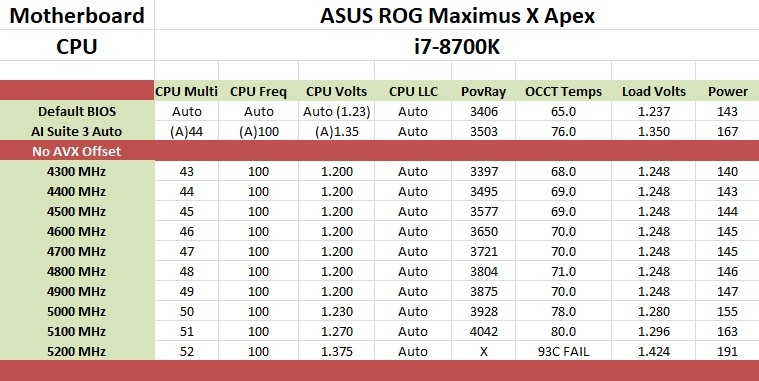 The performance results for the Maximus X Apex placed it at the top of most of our benchmarks so far, leading nearly across the board from our small set of 300-series boards. The only point to pick up on might be the idle power consumption being higher, but that should be expected with a board like this with the extra functionality. When manually overclocking our i7-8700K, it was met with no resistance from the board itself. We were easily able to push this CPU to 5.1 GHz passing our tests. 5.2 GHz brought us to a major voltage wall requiring an additional 0.1 volts, pushing our CPU temperatures well past the 90C limit we use. The automated overclocking (5-Way Optimization) through AI Suite 3 yielded a slight increase in performance, about 100 MHz for all threads (including AVX offset) and 300 MHz for single threaded clock speeds. The large aluminum heatsink covering the power delivery was able to keep them well within specification regardless of manual or auto overclocking. 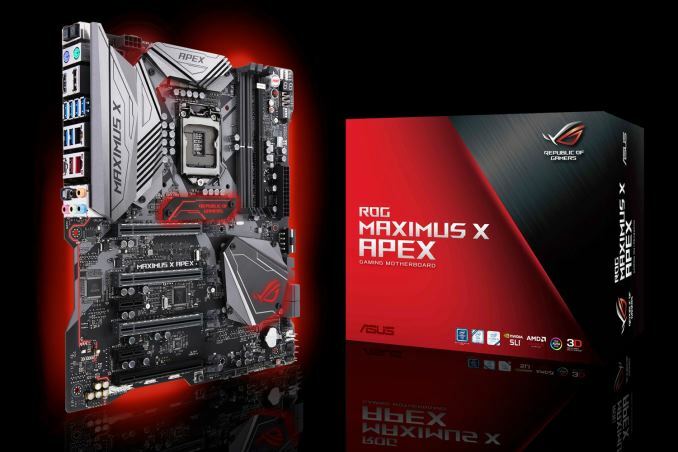 The ROG Maximus X Apex removes M.2 connections on the motherboard and relies solely on the DIMM.2 add-in-card to attach any M.2 devices (SATA, PCIe, Optane). The add-in-card comes with a bracket in order to attach fans (sold separately) used to cool the devices below it. For SATA connected storage, the Apex gives users four ports, supporting RAID 0/1/5/10. 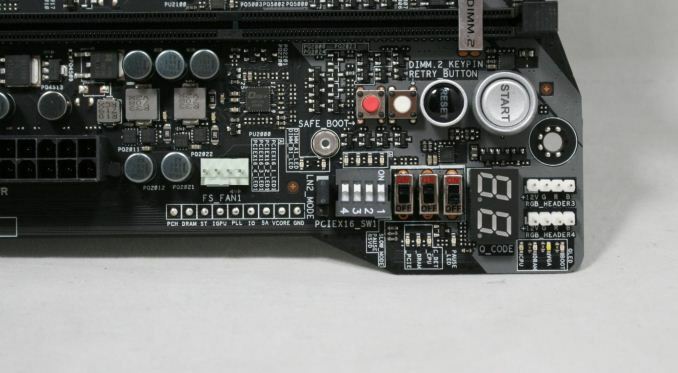 The platform typically includes six SATA ports which are native to the chipset, but with four in use allows the board not to share PCIe resources with the SATA ports. Somewhat unusual for the mainstream Z370 platform, the Apex comes with a total of four full-length PCIe slots (and two PCIe x1 slots). Three of the four full-length slots (grey reinforced) are connected to the CPU and will run at x16, x8/x8, or x8/x4/x4. The full-length slot at the bottom runs at x4 speeds from the chipset, and the x1 slots run at x1. This configuration allows the Apex to support both SLI (two card) and up to 4-way Crossfire. The Apex has two USB 3.1 ports, Type-A and Type-C, located on the back panel IO and fed by the ASMedia ASM3142 controller. Sourced from the chipset are eight USB 3.0 ports with six on the back panel and the rest found as headers on the motherboard. It also includes six USB 2.0 ports via internal headers only. The wired networking side of things is where ASUS really separates this board from most other Z370 options, including an Aquantia 5G network port alongside an Intel I219-V gigabit Ethernet port. I believe ASRock is the only other board partner to have anything above the gigabit mark. There is no wireless option here - the 5 GbE may be welcome to some, though I would imagine if there were a choice of options between wireless and 5 GbE, most users would select the wireless component as the infrastructure for multi-gigabit ethernet in the home still lags behind what enthusiasts have been demanding. 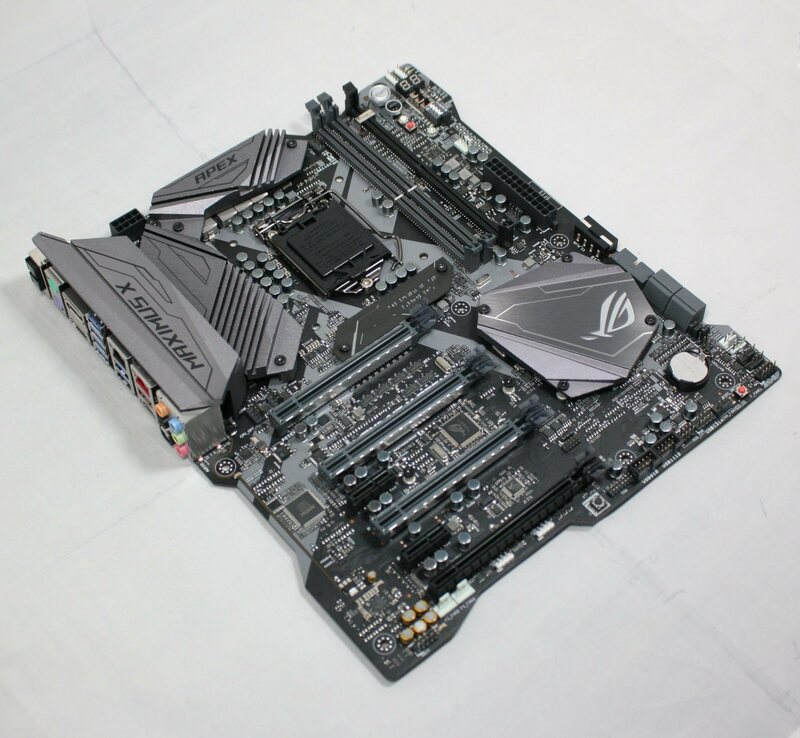 The Apex is not the highest end overclocking motherboard that ASUS offers on Z370, so one might assume that it does not compete directly with other halo motherboards. Ultimately it squares against anything that the competition has geared towards overclocking. Normally this would be products like the GIGABYTE SOC Force, the ASRock OC Formula, and the MSI XPower, however there is no Z370 SOC Force, there is no Z370 OC Formula, and there is no Z370 XPower. The other main manufacturers have focused moreso on gaming related models for Z370, tying in various OC features as required by the pricing segment. This is an odd situation to be in. As we discovered recently, Intel is planning a Z390 chipset launch later this year, where the other manufacturers could be leaning towards that time frame for those versions of their motherboards. ASUS might also be doing this, as it has only launched the Hero/Code/Apex/Formula so far on Z370, and we have not yet seen the ROG Impact or ROG Extreme at this time. The only motherboards near the Apex in Price currently are the ASUS Maximus X Formula ($450 MSRP, on sale for $350), ASRock's Z370 Professional Gaming i7 (MSRP $300, currently $285), ASUS's own Maximus X Code ($280), GIGABYTE's Z370 Gaming 7-OP ($270), EVGA's Z370 Classified K (MSRP $280, currently $236), and MSI's Z370 Godlike Gaming (limited edition). That's pretty much what I expect now (with the possible exception of buying a "non gaming" board for roughly the same price without the LEDs and fancy colors, presumably mostly sold by OEMs to business. It's maxed out on back panel IO. What do you want them to drop to add another pair of ports?